are the little girls in? well, it's the bottom ones at our house. 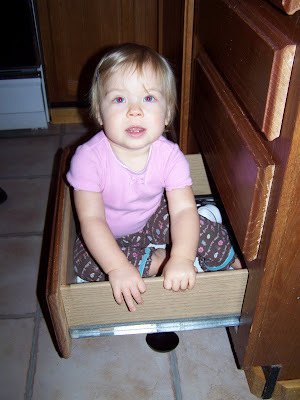 Naomi has now discovered that she can get into her drawer. 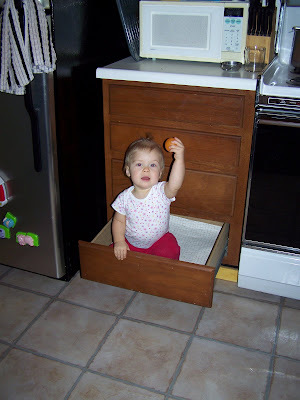 We left the bottom two drawers full of plastic things for her to play with and now, she likes to climb in there too. 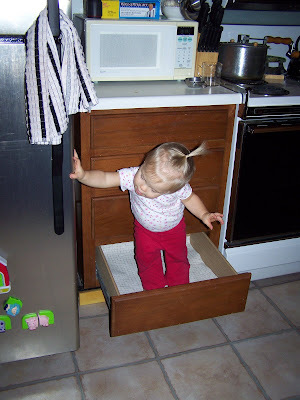 Today she decided to be brave and stand up in the drawer. Although it did make for a cute picture we made sure to stop the behavior...we can't have 10 year olds standing up in drawers now can we? So we need to stop the pattern now. I'm sure it won't be the last time she does it...but it will be the last time I take a picture of it (twice is enough).